Thayumanavar Temple: According to a legend, a woman named Rathnavathi, in an advanced stage of pregnancy was in labor, she requested her mother to come over. Her mother could not reach on time because of heavy floods in the river Cauvery. As delivery time came closer, Rathnavathi prayed to Lord Shiva. Shiva took the form of Rathnavathi's mother and helped with her safe delivery,afterwhich Shiva vanished.Rathnavathi's mother arrived later and both daughter and mother realised that it was Lord shiva in the form of the mother who came to help her deliver the child. 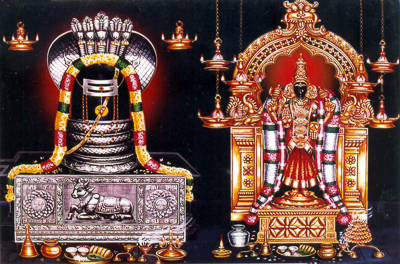 Thus Shiva in this temple came to known as Thayumanaswamy (The God who became the mother). Even today , devotees pray to Thayumanaswamy for the safe delivery of their daughters and offer a whole stalk of green bananas after the safe delivery. This temple is one of the ancient Shiva temples and one of the most important of the 274 Shiva sthalams.This temple is said to be constructed by Mahendra verman during 7th Century AD. We can see many beautiful art work inthe ceiling and the walls. We can also see the monolithic art of chain hanging from the ceiling, and a lion with a rolling ball inside his mouth that are mind blowing stone art works. Uchipillayar literally means 'Pillayar - Ganesha at the top '(of the hill). 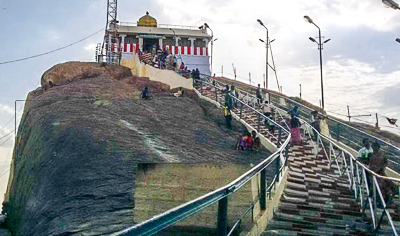 After your darshan at the Thayumanavar sannithi, you have to ascend around more than 400 plus steps to reach the top of the hill where the sanctum of Lord Vinayaka is situated. The steps are a little bit steep and may be difficult during the afternoon. The ideal time to ascend is early morning before 10 am or after 4 pm. As per legends,King Vibhishana, the pious and truth abiding brother of Ravana, who supported King Rama in the battle against his brother Ravana. After destroying Ravana, Lord Rama gave Vibishana an idol of Lord Ranganathan (Vishnu). Devas wanted to stop this idea of an Asura King taking Lord Vishnus idol to his Kingdom. They sought the help of Lord Vinayaka. Vibhishana, on his way back to Sri Lanka, passed through a place (now known as Trichy), and wanted to bathe in the beautiful river Cauvery. But as per a divine condition,the idol he has been carrying, once placed on land, can never be removed, and will remain in that place forever. Vibishana looked around for someone to hold the deity while he took bath and he saw Lord Vinayaka, disguised as a cowherd. When Vibishana entered the river, the cowherd placed the idol on the ground near the banks of Cauvery. Vibhishana saw this and in a fit of rage chased the boy, but the boy ran to the top of a rocky hill nearby. Vibhishana caught the boy and hit him on the fore head. (Devotees can see a small dent in the forehead of the idol even today). The cowherd then revealed himself as Lord Vinayaka . 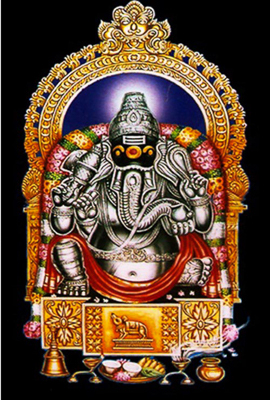 Vibishana fell at the Lord's feet.Ganesha explained that the idol of Ranganatha that Vibishana was carrying, was destined to remain in the place near the river Cauvery, which is now called Srirangam. The place in which the Ranganathan idol was kept was later covered in the forests and it is said that it was discovered when a Chola king chasing a parrot found the deity accidentally. 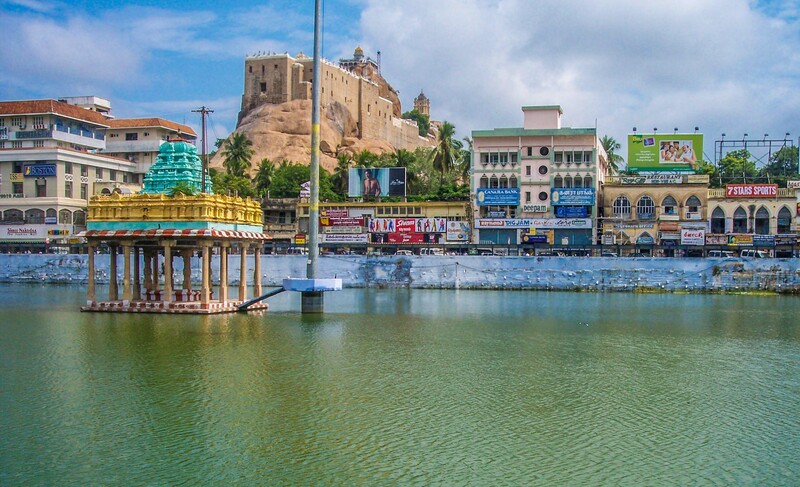 He then consecrated and built the Sri Rangam Ranganathaswamy Temple.History shows that the Pallavas built the Vinayaka temple and the Thayumanaswamy temple, in the rocky hillock where Vinayaka tried to escape Vibishana. Atop the hill at the temple, one can have a beautiful view of the Trichy town and beyond. The idol of Lord Ganesha is quite big and beautiful. He is said to sit at the top of the hill and watch over the devotees. Devotees, who come here with a prayer, always gets their wishes fulfilled. The temple tank or the Theppa Kulam is situated to the North of the Rockfort temple. During the day before Panguni Uthram (Phalguna - mid march to mid April), float festival is celeberated, where many devotees from nearby places participate. There are many shops around the temple tank where people throng to buy trinkets,electronic goods,fabrics, fresh vegetables and fruits. Important Festivals: The daily poojas are performed six times a day. There are weekly rituals like somavaram (Monday) and sukravaram (Friday), fortnightly rituals like pradosham, and monthly festivals like amavasai (new moon day), kiruthigai, pournami (full moon day) and sathurthi. 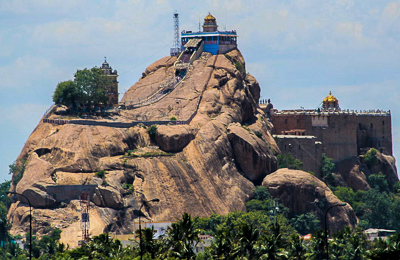 Temple location The Rockfort is visible from almost every part of the city's north.The temple is situated at around 8 kms., north of Tiruchirappalli city. Temple Timings The Uchipillayar Vinayaka temple is open from 6.00 a.m. to 8:00 p.m. and from 4.00 p.m. to 9.00 p.m. The Thayumanaswamy temple is open from 6.00 a.m. to 12:30 p.m. and from 4.00 p.m. to 9.00 p.m.